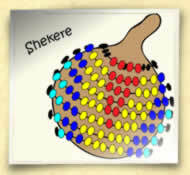 The shekere is an instrument from Africa made out of a hollow gourd. Outside the gourd is a netting that holds seeds or bead so the instrument makes a wonderful rattling when played. How do you play it? This is the best part of this instrument. It gets to jump between your hands and into the air. Of course, you try to catch it and shake it in the rhythm to your song and that makes for lots of fun. Since it can be hard to find a hollow gourd, we're making our shekeres from recycled milk jugs - or similar containers. Start by cleaning out the container and getting some materials you may wish to use. These might include, sand, salt, bird seed, unpopped popcorn or uncooked macaroni. Anything that will shake, rattle and roll! Can you make your recycled container look like a gourd with netting? Draw on beads or seeds or be creative and simply decorate it to your taste. For younger children, you can draw the netting and they can affix their favorite stickers. Some people like to leave their container clear and then fill with interesting contents like glitter and marbles. Experiment and see what you like in your homemade shekere. To play a shekere - you shake a shekere. Let it shake or shimmy for you or toss it gently from hand to hand. If you have a group of children, each can shake it and pass it to the next. And, try it to some music. Although it will sound great with all kinds of music, it is especially suited to the music from Africa (easy to find online or borrow from your local library). Especially wonderful and kid-appropriate is music from the South Africa artists Ladysmith Black Mambazo and Miriam Makeba. You can also hear my Zulu song called Here Come our Mothers. This is a another perfect song to play along with.